The full source code is available on GitHub. In this post I will discuss each step separately. So AF_INET is the integer 2 and SOCK_STREAM is the integer 1. I also need to know the syscall numbers. On my system accept4 is defined and accept is not—it is the same syscall, just with an extra parameter. With all these numbers on hand, I can define some appropriate constants for this first step. This is the entry point of the shellcode so I don’t know what values already exist in the registers EAX, EBX, etc. I will set them to zero first using XOR instructions. EAX must contain the syscall number so I move SYS_SOCKET to AX, overwriting the bottom word of the register with the number. The three integer parameters must be placed in EBX, ECX and EDX. AF_INET and SOCK_STREAM are <256 so they are assigned to BL and CL. EDX needs to be zero so it is XORed. These word and byte-sized registers are used to avoid creating null bytes in the resulting shellcode. int 0x80 will trigger Linux’s syscall handler, which will create the socket, assign it a file descriptor and return that in EAX. Since EAX will be overwritten many times for other syscalls I copy the fd to EDI for safekeeping. A short int is 2 bytes in size. This means the total size of a struct sockaddr will be 16 bytes on this system. How should the data be formatted? A more useful definition comes from the manpage ip(7). For the IP address I will specify 0.0.0.0, which binds to all available interfaces. This is probably what we want for a shellcode. I want the port to be user configurable. I will define a constant LISTEN_PORT at compile time. The assembly will assume that it is a 16-bit number that has already been flipped to network byte order. First, push the struct sockaddr onto the stack in reverse order. ESP will end up pointing at the beginning of the structure. 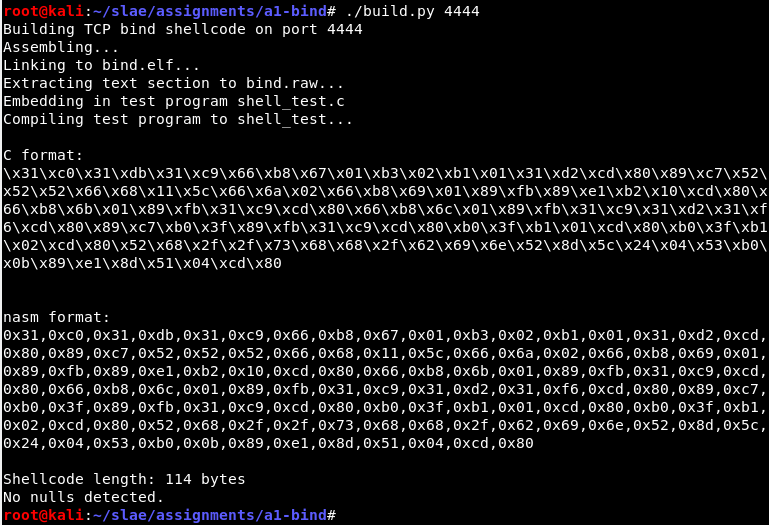 Now I can set up the parameters for the bind syscall and run the syscall handler. EDI still contains the FD from the previous call to socket(). The stack pointer is currently pointing to our structure, so copy that into ECX. We know the size is 16 bytes so place that in DL directly. The first parameter is the same socket fd from earlier, stored in EDI. Since we will only ever handle one connection the backlog can be safely set to zero. listen() will return 0 on success, so eax should be cleared. sockfd is the listening socket, which we have stored in EDI. addr/addrlen specify a struct that will be filled in with the remote address when somebody connects. Since we don’t need that information they may both be set to NULL. flags can also be 0. The return value will be a new file descriptor for the client socket. This is the one that’s important for the bind shell. Since we are only trying to accept a single connection, we will overwrite the listening socket in EDI with this new value. When we exec the shell it will assume that fds 0, 1 and 2 are stdin, stdout and stderr respectively. If we replace all of those fds with our new TCP connection, the shell’s input and output will be forwarded to the remote user. This can be done with the dup2 syscall—it will duplicate an fd to the number of our choosing, replacing anything that was already there. oldfd came from the accept() call and is now stored in edi. We will call this three times, using 0, 1 and 2 as values for newfd. filename must be a null-terminated path to the program to launch. This will be set to “/bin//sh” with the double slash because a length divisible by four makes it easy to push on the stack. argv is a NULL-terminated array of pointers to command line arguments. The first argument should normally always be the program’s name. So this will be a pointer to 8 bytes of memory - the first 4 bytes are a pointer to “/bin//sh” and the second 4 bytes are NULL. envp provides environment variables. We don’t need to add any so we can pass a pointer to NULL. For convenience we will point to the same NULL that is the second half of argp. The shellcode is built into raw opcodes and a test C program, using a build script that includes the desired listening port. See the GitHub repo for details. Now a remote user can connect and use the shell.